Pellet fuels (or pellets) are biofuels made from compressed organic matter or biomass. Pellets can be made from any one of five general categories of biomass: industrial waste and co-products, food waste, agricultural residues, energy crops, and virgin lumber. Wood pellets are the most common type of pellet fuel and are generally made from compacted sawdust and related industrial wastes from the milling of lumber, manufacture of wood products and furniture, and construction. Other industrial waste sources include empty fruit bunches, palm kernel shells, coconut shells, and tree tops and branches discarded during logging operations. So-called "black pellets" are made of biomass, refined to resemble hard coal and were developed to be used in existing coal-fired power plants. Pellets are categorized by their heating value, moisture and ash content, and dimensions. They can be used as fuels for power generation, commercial or residential heating, and cooking. Pellets are extremely dense and can be produced with a low moisture content (below 10%) that allows them to be burned with a very high combustion efficiency. Further, their regular geometry and small size allow automatic feeding with very fine calibration. They can be fed to a burner by auger feeding or by pneumatic conveying. Their high density also permits compact storage and transport over long distance. They can be conveniently blown from a tanker to a storage bunker or silo on a customer's premises. Pellets are produced by compressing the wood material which has first passed through a hammer mill to provide a uniform dough-like mass. This mass is fed to a press, where it is squeezed through a die having holes of the size required (normally 6 mm diameter, sometimes 8 mm or larger). The high pressure of the press causes the temperature of the wood to increase greatly, and the lignin plasticizes slightly, forming a natural "glue" that holds the pellet together as it cools. Pellets can be made from grass and other non-woody forms of biomass that do not contain lignin. A 2005 news story from Cornell University News suggested that grass pellet production was more advanced in Europe than North America. It suggested the benefits of grass as a feedstock included its short growing time (70 days), and ease of cultivation and processing. The story quoted Jerry Cherney, an agriculture professor at the school, stating that grasses produce 96% of the heat of wood and that "any mixture of grasses can be used, cut in mid- to late summer, left in the field to leach out minerals, then baled and pelleted. Drying of the hay is not required for pelleting, making the cost of processing less than with wood pelleting." In 2012, the Department of Agriculture of Nova Scotia announced as a demonstration project conversion of an oil-fired boiler to grass pellets at a research facility. Rice-husk fuel-pellets are made by compacting rice-husk obtained as by-product of rice-growing from the fields. It also has similar characteristics to the wood-pellets and more environment-friendly, as the raw material is a waste-product. The energy content is about 4-4.2 kcal/kg and moisture content is typically less than 10%. The size of pellets is generally kept to be about 6 mm diameter and 25 mm length in the form of a cylinder; though larger cylinder or briquette forms are not uncommon. It is much cheaper than similar energy-pellets and can be compacted/manufactured from the husk at the farm itself, using cheap machinery. They generally are more environment-friendly as compared to wood-pellets. In the regions of the world where wheat is the predominant food-crop, wheat husk can also be compacted to produce energy-pellets, with characteristics similar to rice-husk pellets. 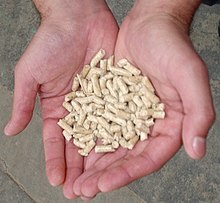 A report by CORRIM (Consortium On Research on Renewable Industrial Material) for the Life-Cycle Inventory of Wood Pellet Manufacturing and Utilization estimates the energy required to dry, pelletize and transport pellets is less than 11% of the energy content of the pellets if using pre-dried industrial wood waste. If the pellets are made directly from forest material, it takes up to 18% of the energy to dry the wood and additional 8% for transportation and manufacturing energy. An environmental impact assessment of exported wood pellets by the Department of Chemical and Mineral Engineering, University of Bologna, Italy and the Clean Energy Research Centre, at the University of British Columbia, published in 2009, concluded that the energy consumed to ship Canadian wood pellets from Vancouver to Stockholm (15,500 km via the Panama Canal), is about 14% of the total energy content of the wood pellets. Pellets conforming to the norms commonly used in Europe (DIN 51731 or Ö-Norm M-7135) have less than 10% water content, are uniform in density (higher than 1 ton per cubic meter, thus it sinks in water)(bulk density about 0.6-0.7 ton per cubic meter), have good structural strength, and low dust and ash content. Because the wood fibres are broken down by the hammer mill, there is virtually no difference in the finished pellets between different wood types. Pellets can be made from nearly any wood variety, provided the pellet press is equipped with good instrumentation, the differences in feed material can be compensated for in the press regulation.. In Europe, the main production areas are located in south Scandinavia, Finland, Central Europe, Austria, and the Baltic countries. Regulatory agencies in Europe and North America are in the process of tightening the emissions standards for all forms of wood heat, including wood pellets and pellet stoves. These standards will become mandatory, with independently certified testing to ensure compliance. In the United States, the new rules initiated in 2009 have completed the EPA regulatory review process, with final new rules issued for comment on June 24, 2014. The American Lumber Standard Committee will be the independent certification agency for the new pellet standards. Wood pellets, in particular freshly made, are chemically active and can deplete the atmosphere of the oxygen required to sustain life. Wood pellets can also emit large quantities of the poisonous carbon monoxide. Fatal accidents have taken place in private storerooms and onboard marine vessels. When handled, wood pellets give off fine dust which can cause serious dust explosions. Pellet boilers are standalone central heating and hot water systems designed to replace traditional fossil fuel systems in residential, commercial and institutional applications. Automatic or auto-pellet boilers include silos for bulk storage of pellets, a fuel delivery system that moves the fuel from the silo to the hopper, a logic controller to regulate temperature across multiple heating zones and an automated ash removal system for long-term automated operations. Emissions such as NOx, SOx and volatile organic compounds from pellet burning equipment are in general very low in comparison to other forms of combustion heating. A recognized problem is the emission of fine particulate matter to the air, especially in urban areas that have a high concentration of pellet heating systems or coal or oil heating systems in close proximity. This PM2.5 emissions of older pellet stoves and boilers can be problematic in close quarters, especially in comparison to natural gas (or renewable biogas), though on large installations electrostatic precipitators, cyclonic separators, or baghouse particle filters can control particulates when properly maintained and operated. Per the New Hampshire Office of Energy and Planning release on Fuel Prices updated on 5 Oct 2015, the cost of #2 Fuel Oil delivered can be compared to the cost of Bulk Delivered Wood Fuel Pellets using their BTU equivalent: 1 ton pellets = 118.97 gallon of #2 Fuel Oil. This assumes that one ton of pellets produces 16,500,000 BTU and one gallon of #2 Fuel Oil produces 138,690 BTU. Thus if #2 Fuel Oil delivered costs $1.90/Gal, the breakeven price for pellets is $238.00/Ton delivered. Usage across Europe varies due to government regulations. In the Netherlands, Belgium, and the UK, pellets are used mainly in large-scale power plants. The UK's largest power plant, the Drax power station, converted some of its units to pellet burners starting in 2012; by 2015 Drax had made the UK the largest recipient of exports of wood pellets from the US. In Denmark and Sweden, pellets are used in large-scale power plants, medium-scale district heating systems, and small-scale residential heat. In Germany, Austria, Italy, and France, pellets are used mostly for small-scale residential and industrial heat. The UK has initiated a grant scheme called the Renewable Heat Incentive (RHI) allowing non-domestic and domestic wood pellet boiler installations to receive payments over a period of between 7–20 years It is the first such scheme in the world and aims to increase the amount of renewable energy generated in the UK, in line with EU commitments. Scotland and Northern Ireland have separate but similar schemes. From Spring 2015, any biomass owners—whether domestic or commercial—must buy their fuels from BSL (Biomass Suppliers List) approved suppliers in order to receive RHI payments. Pellets are widely used in Sweden, the main pellet producer in Europe, mainly as an alternative to oil-fired central heating. In Austria, the leading market for pellet central heating furnaces (relative to its population), it is estimated that ​2⁄3 of all new domestic heating furnaces are pellet burners. In Italy, a large market for automatically fed pellet stoves has developed. Italy's main usage for pellets is small-scale private residential and industrial boilers for heating. In 2014 in Germany the overall wood pellet consumption per year comprised 2,2 mln tones. These pellets are consumed predominantly by residential small scale heating sector. The co-firing plants which use pellet sector for energy production are not widespread in the country. The largest amount of wood pellets is certified with DINplus and these are the pellets of the highest quality. As a rule, the pellets of lower quality are exported. in 2019, India started co-firing biomass pellets in coal fired power stations around its capital city Delhi to reduce the air pollution caused by the stubble/biomass burning in open fields to clear the fields for sowing next crop. Plans are made to use biomass pellets for power generation through out the country to utilize nearly 145 million tonnes of agricultural residue to replace equal quantity of imported coal in power generation. Some companies import European-made boilers. As of 2009, about 800,000 Americans were using wood pellets for heat. It is estimated that 2.33 million tons of wood pellets will be used for heat in the US in 2013. The US wood pellet export to Europe grew from 1.24 million ton in 2006 to 7 million ton in 2012, but forests grew even more. When small amounts of water are added to wood pellets, they expand and revert to sawdust. This makes them suitable to use as a horse bedding. The ease of storage and transportation are additional benefits over traditional bedding. However, some species of wood, including walnut, can be toxic to horses and should never be used for bedding. The biomass pellets made from edible matter can also be used as cattle fodder by importing from far away fodder surplus places to overcome the fodder shortage. Wood pellet grills have gained popularity as a versatile way to grill, bake, and smoke. The size of the pellets makes it useful for creating a wood fired grill that still controls its temperature precisely. ^ "Organic Energy Ltd". Organicenergy.co.uk. Retrieved 25 November 2015. ^ "About the Densified Biomass Fuel Report". U.S. EIA. October 17, 2018. Retrieved October 23, 2018. ^ Wood Pellets from PKS & Coconut Shell. "Wood Pellets from PKS and Coconut Shell". Retrieved 13 January 2013. ^ a b c d e f g Cardellichio, P.; et al. (2010). Walker, T. (ed.). "Massachusetts Biomass Sustainability and Carbon Policy Study: Report to the Commonwealth of Massachusetts Department of Energy Resources" (PDF). Natural Capital Initiative Report NCI-2010-03. Brunswick, Maine. : Manomet Center for Conservation Sciences. Retrieved 2014-03-14. ^ a b "Wood Pellet Central-Heating Solution for Homeowners and Small Industry". MY WOOD PELLET SOLUTION. Archived from the original on 23 January 2012. Retrieved 30 December 2011. ^ Cocchi, Maurizio (December 2011). "Global Wood Pellet Industry Market and Trade Study" (PDF). IEA Task 40. Archived from the original (PDF) on 25 April 2012. Retrieved 1 June 2012. ^ Fuller, Ron. "Pelleting Process" (PDF). University of Illinois. Archived from the original (PDF) on 18 July 2010. Retrieved 8 December 2011. ^ "Don't let grass grow under your feet -- burn it as economical, environmentally friendly biofuel, Cornell expert urges". Archived from the original on 2012-08-19. Retrieved 2015-06-14. ^ "Grass pellet heating system intended to provide new cash crop for farmers". Trurodaily.com. ^ Missagia, Bruna; Guerrero, Cinthya; Narra, Satyanarayana; Sun, Yiling; Ay, Peter; Krautz, Hans Joachim (15 December 2011). "Physicomechanical Properties of Rice Husk Pellets for Energy Generation". Energy & Fuels. 25 (12): 5786–5790. doi:10.1021/ef201271b. ^ "Wheat bran pellets". Tis-gdv.de. Retrieved 10 January 2019. ^ Francesca Magellia; Karl Boucherb; Hsiaotao T. Bib; Staffan Melinc; Alessandra Bonolia. "An environmental impact assessment of exported wood pellets from Canada to Europe" (PDF). Forgreenheat.org. Retrieved 10 January 2019. ^ "Advancement of pellets-related European standards". WIP Renewable Energies. Archived from the original on April 26, 2012. Retrieved 11 December 2011. ^ "Standards of Performance for New Residential Wood Heaters". Epa.gov. ^ Jacobs, Scott. "PFI Standards Program Major Developments". Pellet Fuels Institute. Archived from the original on 13 January 2012. Retrieved 2 January 2012. ^ Gauthier, Saskia; Grass, Hildegard; Lory, Martin; Krämer, Thomas; Thali, Michael; Bartsch, Christine (2012). "Lethal carbon monoxide poisoning in wood pellet storerooms—two cases and a review of the literature". Annals of Occupational Hygiene. 56 (7): 755–763. doi:10.1093/annhyg/mes047. PMID 22879445. ^ Hedlund, Frank Huess; Hilduberg, Øssur Jarleivson (2016). "Fatal Accidents During Marine Transport of Wood Pellets Due to Off-gassing–Experiences from Denmark" (PDF). Biomass. InTech Open Access Publishers. doi:10.5772/66334. ISBN 978-953-51-2937-0. ^ Hedlund, F. H.; Astad, J.; Nichols, J. (2014). "Inherent hazards, poor reporting and limited learning in the solid biomass energy sector: A case study of a wheel loader igniting wood dust, leading to fatal explosion at wood pellet manufacturer" (PDF). Biomass and Bioenergy. 66 (66): 450–459. doi:10.1016/j.biombioe.2014.03.039. ^ "All About Pellet Stoves". Thisoldhouse.com. 7 December 2012. Retrieved 10 January 2019. ^ "Wood Pellet Central Heating Systems". Archived from the original on 2015-02-17. ^ "Fuel prices per kWh (excluding VAT)". Biomassenergycentre.org.uk. Archived from the original on 2013-12-03. Retrieved 2008-10-20. ^ "Okofen condesing pellet boiler". Okofen.co.uk. Retrieved 10 January 2019. ^ a b c Booth M (2010). "Review of the Manomet Biomass Sustainability and Carbon Policy Study. Report for the Clean Air Task Force" (PDF). Catf.us. Retrieved 10 January 2019. ^ "User's guide to small scale biomass and wood pellet production" (PDF). Biofuelmachines.com. Retrieved 10 January 2019. ^ Moomaw, W. (2011). "Should we get our electricity by burning trees? Presentation at Williams College" (PDF). Sustainability.williams.edu. ^ "Principles of Sustainable Biomass; policy of 12 large U.S. environmental organizations" (PDF). Wilderness.org. 27 August 2011. ^ "Wood Pellet Fuel Production". Nef.org.uk. ^ "The Bradley Burner". Bradleyburner.com. ^ "North America's Wood Pellet Sector" (PDF). Fpl.fs.fed.us. Retrieved 10 January 2019. ^ "Development and promotion of a transparent European Pellets Market Creation of a European real-time Pellets Atlas" (PDF). Liverpoolwoodpellets.co.uk. Retrieved 2015-06-26. ^ "UK's renewable energy targets drive increases in U.S. wood pellet exports". U.S. Energy Information Administration. April 22, 2015. ^ "Main pellet consumers in Europe". IHB. Fordaq S.A. 3 September 2013. ^ "The Industrial Pellet Market in Germany". GBP. German Biofuel Portal. 3 March 2016. ^ "Air Pollution: Delhi sees hope as NTPC steps in to buy crop residue from farmers". Retrieved 25 September 2017. ^ "NTPC's Co-Firing Of Agricultural Residues Based Fuel Could Be The Game Changer In The World Of Power Generation". Retrieved 25 January 2019. ^ Nielsen, S; George A. Estcourt; Carolyn J. Hodgson (October 2004). "New Bioenergy options for New Zealand – an evaluation of wood pellet opportunities" (PDF). Forest Research. Archived from the original (PDF) on 2008-10-14. Retrieved 2008-10-17. ^ "Environmental Implications of Increased Reliance of the EU on Biomass from the South East US" (PDF). Aebiom.org. Retrieved 10 January 2019. ^ Hooser, DVM PhD, Stephen B. (Jan 2005). "Laminitis Caused by Black Walnut Wood Residues" (PDF). Purdue University. Archived from the original (PDF) on 14 June 2010. Retrieved 20 October 2012. Because of the possible severe consequences of poisoning, stall bedding for horses should never contain black walnut wood. ^ "Global Bio Ltd". Globalbiokltd.com. ^ "Fodder pellets out of paddy straw to tackle burning issue". Retrieved 24 January 2019. ^ "Introducing pellet as animal fodder". Retrieved 29 January 2019. ^ "A Guide to Pellet Grills". Barbecuebible.com.